Suitable for kids aged 5–12 and their adults, take a hilarious leap into the world of the orchestra with musical comedy trio, Tripod, Associate Conductor, Benjamin Northey and one fun-loving orchestra. Inspired by the brilliant Leonard Bernstein, and in celebration of his one hundredth anniversary, Tripod will reveal the history of humour in music with the perfect pairing of comedy and classical music. 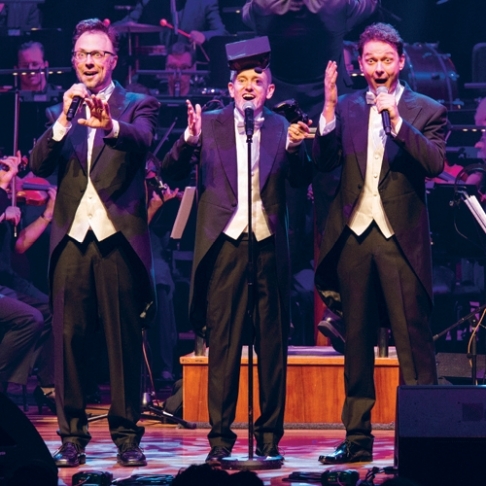 Renowned for their three part harmony, Tripod will take every opportunity to sing with the spectacular orchestra in what promises to be a witty, cheeky and fun afternoon. 50 minutes, no interval. Prefer an evening out with Tripod and the MSO? Read more about our evening, family friendly performance of MSO vs. Tripod here.